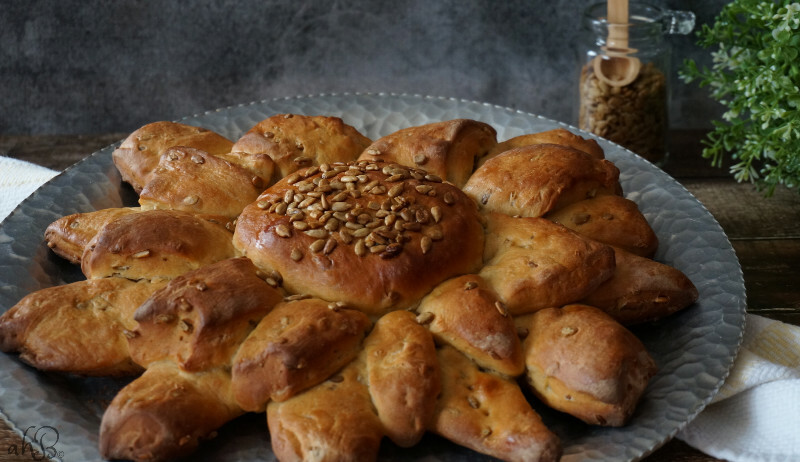 Invoking thoughts of summer and sunflowers, this Sunflower bread is an easy multi-grain bread, slightly sweet and a bit nutty, altogether enjoyable. I hope that you all had a most wonderful Christmas. I did not. I spent all of the holiday sick or tending to sick kids. We played pass the strep throat and it got most of the way through my household. There are no winners in this game. It was awful stuff, and unfortunately because of the holiday, we spent several days unable to get in to the see the doctor. But all is well now, or at least, on the mend working it’s way to well. Thank heavens. With the bustle and excitement of Christmas and the New Year gone, we trudge on into the rest of winter. The next few months always seem like the longest to me. I am not a winter girl. The one consolation of these cold gray days spent stuck inside, is that there is plenty of opportunity to bake. While the frigid temperatures, snow, and in Missouri, so very much rain, rage on outside, my house can be my warm cozy den, scented with the most divine smell of fresh baked bread inside. 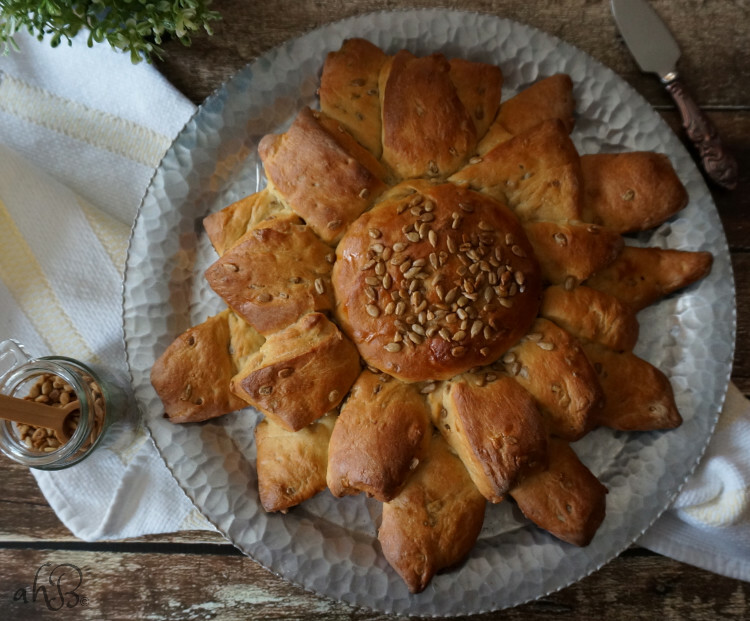 The Sunflower Bread I am sharing with you today could more aptly be defined as a multi-grain bread, because it does have a variety of flours and grains, but I just love the bright and cheerful image the name invokes. 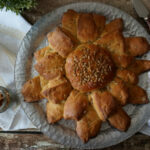 Sunflower bread makes me think of summer vacations, long and lazy hours spent in the car driving across the great flat state of Kansas with its giant fields full of thick-headed, nodding yellow flowers heavy laden with their kernels. Sunflower fields and wind farms, the two graces of Kansas’s rather plain horizon. The sunflower seeds add a nutty sweetness to this bread and a toothsome texture that is quite pleasant. But taste and texture aside, sunflower seeds are rich in vitamin E and have natural anti-inflammatory properties, which means that if the cold winters are making your joints ache, eating some sunflower seeds might be a natural defense to ease those creaking knees. Yes, my knees most definitely creak and ache thanks to my wild years of playing roller derby. 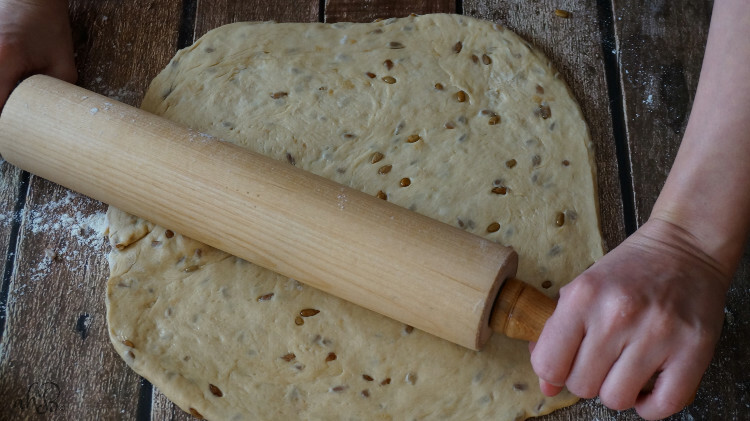 Sweetened with honey and molasses, this dough can be used to make multigrain dinner rolls, 2 regular loaves of bread or two sunflower shaped breads like the ones I’ve made. Whether it’s the sweet hope of sunny flowers to come, the intoxicating smell of bread fresh from the oven, or even the hope that a slice of bread can ease some aches of both a hungry belly and the joints, I think that this bread is definitely one to bake this winter. In large mixing bowl, or the bowl for a stand mixer, combine 2 cups of all purpose flour, the white wheat flour, sunflower seeds, yeast and salt. Heat together the water, milk, honey, molasses and butter in a small saucepan until warmed to 120 degrees. Add your warmed liquids to the flour mixture and beat until smooth. Add enough of the remaining all purpose flour to create a soft dough. Turn the dough out onto a floured surface and knead with a push-turn method for 6-8 minutes, or until the dough is smooth and elastic. Place into an oiled bowl, turning the dough once to ensure the top is oiled as well. Cover loosely and set aside in a warm place to let rise until doubled, about an hour. If you don't have a warm place to let the dough rise, pour some boiling water into a bowl and put it on the bottom rack of your oven, place the covered dough on the rack above it and leave in the oven to rise. The steam from the water will create the perfect environment for the dough to rise. After the dough has doubled in size, punch the dough down to remove the large air bubbles. Divide in half. Leave one half covered, and turn the other half out onto a floured work surface. Shape each half into loaves, if desired, and place in greased loaf pans. 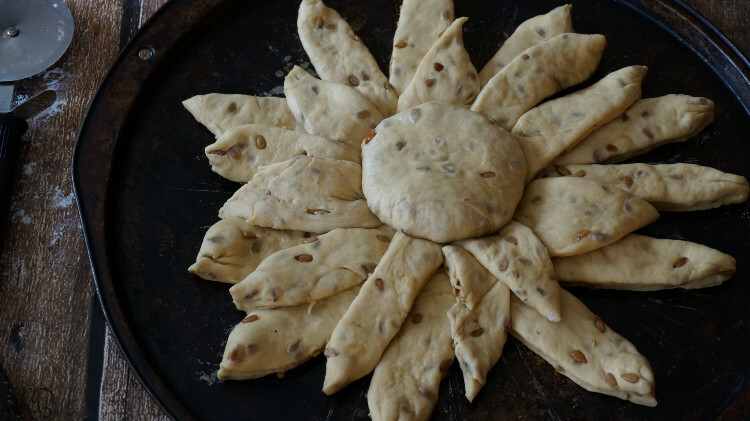 To shape into sunflowers, remove a quarter of the dough and shape into a small round disk, 4-5 inches in diameter, set aside. 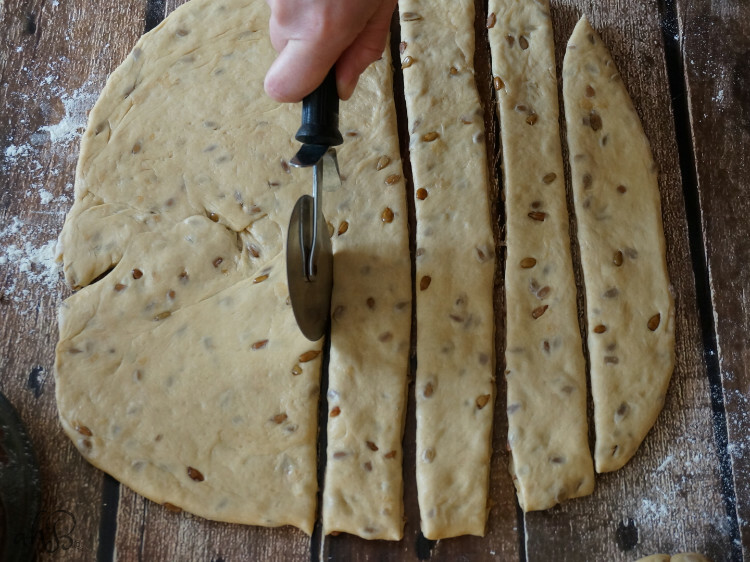 Roll the remaining dough out into a 10-12 inch circle. Using a pizza cutter, cut into squares. On a round pizza pan or baking stone, lay the pieces out into a circle, layering to create the petals of the sunflower. Top with the disk of dough for the center. Repeat with the remaining dough for the second loaf. Cover and let rise again until puffy and doubled about 45 minutes. Whisk together one whole egg, 2 teaspoons of water, and a pinch of salt for the egg wash. Lightly brush the loaves with egg wash and sprinkle with extra sunflower kernels if desired. Bake sunflower loaves for 30-35 minutes and regular shaped loaves for 35-45 minutes or until golden brown on the tops. What a beautiful bread! A great surprise during the dreary winter days. Thank you Kellie! This would make a lovely pick me up surprise to take to a friend. Anyway, I’d love it if one of my friends showed up at my door with fresh baked bread! Sorry your were sick over the holidays. Hope 2016 is off to a good start, though. This bread, though! Gorgeous and so creative! What a loaf of cheer for the dreary winter months. Just lovely! It makes a really yummy bread, Kathie. Totally different from most too. Unfortunately my last kiddo just started in with the strep last night! I’m hoping that it stops with him. The only other person in the family who hasn’t had it is my husband and he’s got too much going on right now to get sick. No wonder you’re a happy baker! With bread like this, I’d be overjoyed too!! Fresh baked bread is one of my favorite things ever and never fails to make me happy. 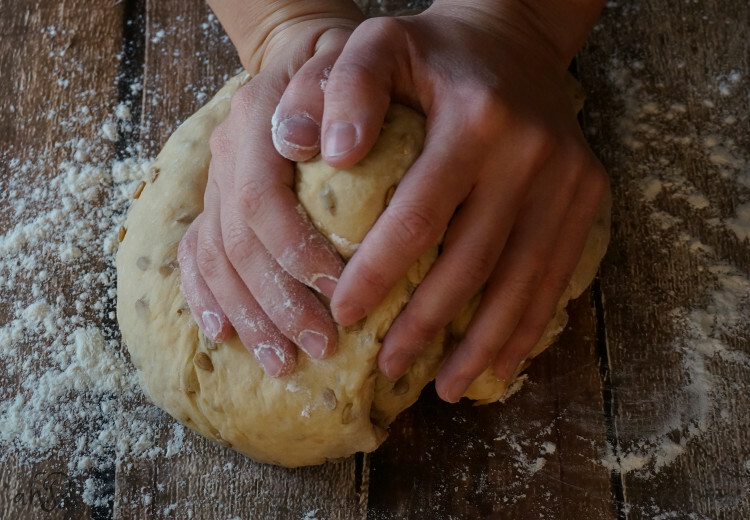 It always makes me think of memories with my grandmothers and great aunt in the kitchen patiently letting me try to knead the dough and shape it, making a mess of it and gently helping me get it right. I try to be that patient with my kiddos, but I often fail. Ah, something to aspire to anyway! Thanks for the comment and the rating! I’m so sorry to hear you had to suffer through sickness during the holidays. What a bummer. Your bread certainly is a bright, fun creation for a dull winter day. I love how cute the baked flower turned out. Yes, I’m hoping now that we’ve put in our quota for a while and can have several years of sick-free holidays now. It had been awhile since we’d had an illness during the holidays that bad, like 15 years, so I guess we were kind of due. But man it sure stinks to miss all the fun. This is such a stunning bread – so creative in the presentation (I need to try this!) and I love the cheery “sunflower” theme, too! Thanks Alisa. I love making pull-apart breads. They are one of my favorites. Looks like just the thing to brighten up winter, Amy! Plus, it’s got the words “sun” and “flower” in the title, which just makes it happy already! Nice. I agree. It’s hard not to feel brightened up by sunflowers. They are one of my favorites.